Money Riches herbal blends have been used for money, good fortune, money related matters, and protection. A mixture of home grown garden herbs. 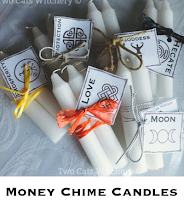 Use with a money charm bag, green or gold candle which represents money, or with crystals for money and employment such as Yellow Aventurine, emerald, copper, or citrine. Home grown, cut, dried, and hand mixed from our garden and yard. These herbs are hand blended using only the finest natural ingredients, with specific intentions in mind. Rub on candles, sprinkle on windows or door frames, place under or around crystals, put in mojo or charm bags, or burn as incense in a burner. All herbs are natural ingredients, so one can rub on oneself, mix with oils to use as a ritual perfume, or even mix with Epson salts to use in a bath. 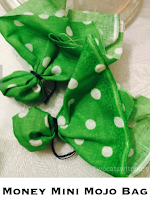 If you have allergies or sensitive skin, I advise testing before using on skin or in a bath. Made to order, each herb is mixed special for you. 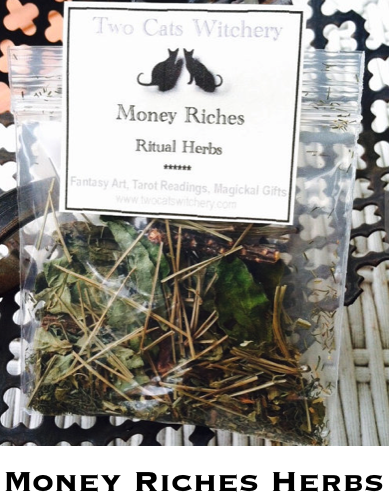 These herbs are tools only, the ritual, intent, and outcome is up to you. Align this herb with you and your specific intent before using. Hold it in your hand, visualize and state out loud your intended outcome. Do this until you feel the herb is aligned with yourself and your intent. Placing the herb under a full moon is also believed by many cultures and spiritual paths to "charge" the herb. Visualize and state out loud your intended outcome while placing the herb under the moon. Leave over night. Sun "charging" is done the same way. Each herb comes in a plastic zip lock style bag. Store in a cool, dry place such as a cabinet. These herbs go along way, so use sparingly. NOT for consumption. Ready for your use. If you have any questions, please contact me prior to purchasing. Please allow 3 - 5 days for making. ~ please note, this listing is only for 1 bag of herbs. Props are for photo's only. All rights reserved. 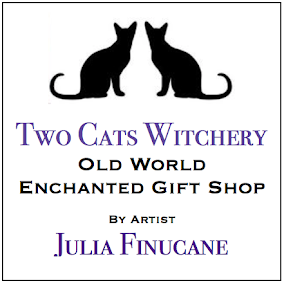 Copyright ©2015 - 2018 by Julia Finucane at Two Cats Witchery. Buyer is not purchasing the rights to the item. The item is not to be copied, published, imitated, re-distributed, or reproduced in any way. Please do not buy items to sell as your own. All sales are Final due to the nature of the products and spiritual beliefs associated with them.